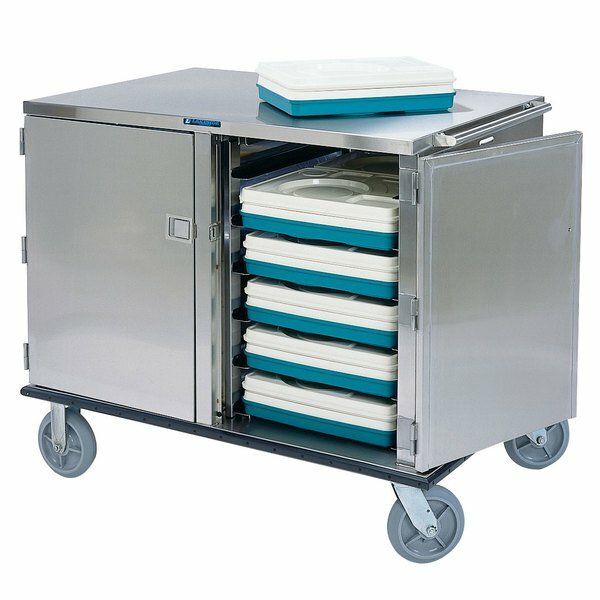 Ensure excellent quality and efficiency for your meal delivery with this Lakeside 835 Premier Series stainless steel low profile tray cart! This unit holds (24) 14" x 18" or 15" x 20" trays and has a 5" clearance between ledges. Each ledge holds two trays. An added advantage is that it transports a large number of trays in a safe way without height obstruction from the cart. The low profile design allows you to see over the cart as you maneuver it through kitchens and hallways! This tray cart features vented side panels that help prevent build-up from heat and condensation to keep the cabinet at a more consistent temperature. For convenient, unobstructed access to the cabinet, the door opens 270 degrees. A long-life door latch will hold up to repeated opening and closing, while door catch features assure that the door is properly closed. The entire unit features stainless steel construction for superior durability. Removable, durable ledge panels and a convenient floor drain make cleaning easy. Side-mounted and recessed handles on both ends of the unit maximize maneuverability. Two swivel (with brakes) and two fixed 8" casters guide the cart in a straight line while also making it easier to turn! Perimeter bumpers come standard to help protect walls and furniture during transport.